President Emmerson Mnangagwa gives a speech at the ZANU-PF rally at the White City Stadium in Bulawayo, Zimbabwe Saturday. Shortly after his speech ended, there was an explosion. 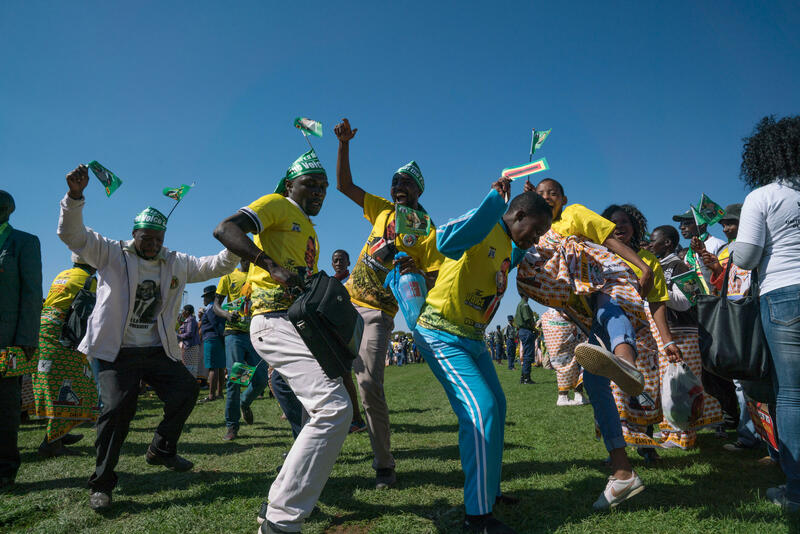 People at a Zanu PF rally at the White City Stadium in Bulawayo, Zimbabwe where President Mnangagwa was to give an address on June 23, 2018. People at a ZANU-PF rally at the White City Stadium in Bulawayo, Zimbabwe where President Mnangagwa was to give an address on June 23, 2018. A video circulating social media shows Mnangagwa walking off the stage, fists in the air, as he's accompanied by a small group of officials. Seconds after they exit, there's an explosion, knocking people over and spewing smoke and debris into the crowd. The blast occurred at White City Stadium in Bulawayo, Zimbabwe's second-largest city. 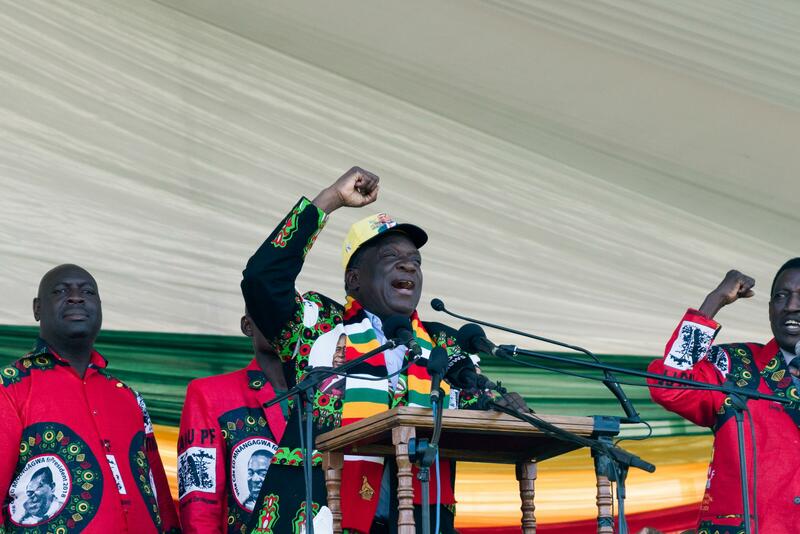 Mnangagwa was there campaigning ahead of the nationwide elections taking place next month. Mnangagwa's spokesperson George Charamba said in a statement that the president was not injured and investigations are underway, "There have been multiple attempts on the President's life over the past five years." Two people died from their wounds, according to Reuters. One of Zimbabwe's vice presidents, Constantino Chiwenga, and his wife had minor injuries. Mnangagwa tweeted his concern for the victims, saying he had already visited some of them in the hospital. He then wrote, "Let us continue to be united and address our differences peacefully. The strongest response to violence is peace. The strongest response to hate is love." Mnangagwa came into power last November after divisions in the ZANU-PF party caused massive upheaval. Weeks of political chaos led former President Robert Mugabe to resign after 37 years in office. The elections on July 30 will be the first since 1980 — the year the country gained independence from white minority rule — that Mugabe is not in the running. 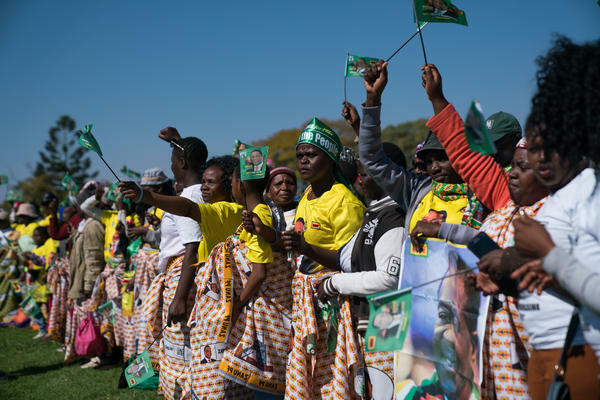 As NPR's Ofeibea Quist-Arcton has reported, Mnangagwa's rise to the presidency was fraught and some Zimbabweans are skeptical of how much change the new leader will create because of his close connection to Mugabe. NPR's Ari Shapiro was in the audience at the rally Saturday. He's in Zimbabwe with a team from All Things Considered to cover the upcoming historic elections. They attended the rally, which he describes as "exuberant while we were there," with people dancing and waving green flags. They left shortly before the explosion. "All week we've been doing interviews with people who have expressed cautious optimism that this election will be different from past elections in this country. And so far the campaign has been relatively free of violence. Today marks a change - there are police roadblocks in the city now and members of the president's cabinet are in the hospital. It's impossible right now to say how this will change the campaign but this is going to have ripples."